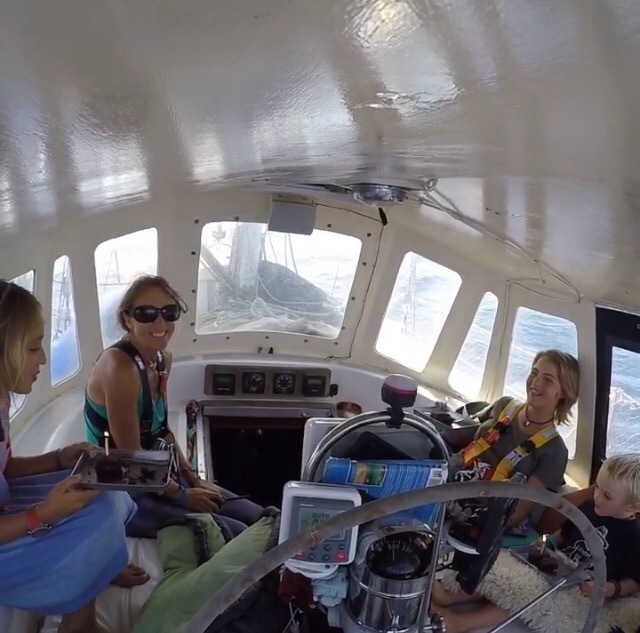 Mexico to Costa Rica, our 1650 mile upwind passage completed! Our first big passage: over 1,500 miles and over 2 weeks from Barra de Navidad to Costa Rica! night watch, which starts at 11pm and goes to 3 am, I find myself ready to start writing. I start my watch with little breath of wind realizing that I’m beginning to recognize the stars that join me during these quiet hours to myself. Just after 11pm I see Leo rising from the eastern horizon, Orion is almost straight above our mast, and Taurus is just a little north. The Milky Way, almost running North to South. One hour later, the “pot” of the Big Dipper starts to make its appearance in the eastern horizon. The nights have been clear, and the stars brilliantly lit. The moon is new, making the stars more visible. four hours of watch. Solitude, reflection, reading, a little #shipshape exercise, and now writing. hifted from null to on the nose at about 5-8 kts, is forcing us to head east toward shore. For the most part, we’ve been having more southerlies than anticipated, however they have been light and more from the southeast, therefore taking us smoothly south as we hoped for. 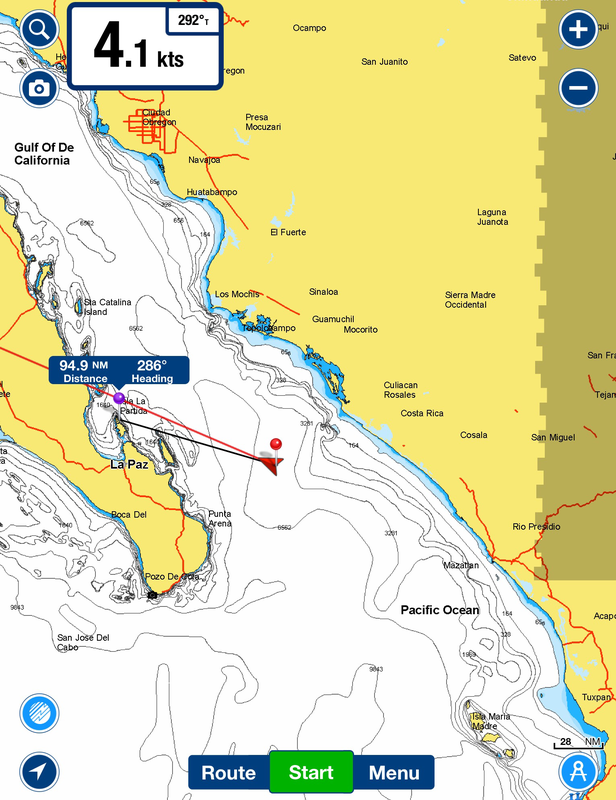 We set our course for aiming to be 300 miles offshore from the Tehuanapecs. We were pushed out a bit further over the last few days, so the this little bit of easterly heading was ok.
day four we had gone nearly 400 miles. Not the fastest four days, but we expected this much from the forecast we downloaded before we left. 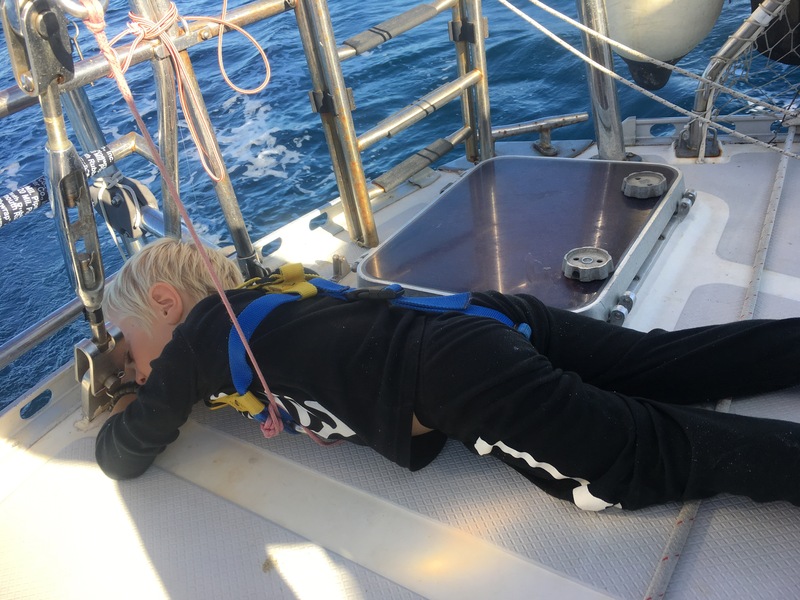 We’ve had many hours of sailing an average of 6kts with the wind behind us, and then again in front of us and hours of bobbing around with not a breathe of wind in sight. red out of Barra de Navidad and actually kept the motor on despite decent winds. Our batteries were running low after many days of overcast weather. We also needed to make water after leaving the Laguna de Barra de Navidad. So we needed that power and Shawnigan’s motor needed to be ran anyway. After four hours of motor sailing and heading offshore and south, the iron sail was turned off and not used again for many days. he first day. A little nausea among us ladies aboard, but nothing severe. My time below was limited, and not as much schooling was done as we hoped for. By day 2 we were well on our way to regaining our sea legs. at this point Taj came down with a fever. It started low and didn’t seem like anything to be worried about, he usually gets a mild fever with his growth spurts. But as the day progressed so did his fever. His energy was zapped, he wouldn’t eat or drink and slept all day. By 2pm his fever reached 104.9! Parent panic started to kick in. We carry a bunch of first aid medication aboard. We already had started our “natural remedy” regimen, but it was clearly time for Advil. Within 45 min his fever started to decline and by 4pm it broke as he sweated it out profusely. We were, at this stage, on the fence about whether to head straight into Manzanillo, about 100 miles away at that point, or to continue on. It was extremely hard to make that choice. Deep down I felt like he would be fine, as long as we kept on our regimen. I had to resort to rectal doses, for he lost his desire for anything “tasting gross”. For the next 24 hours he was up and down in temperature, but never above 103, and his energy was up and down as well. He slowly had more desire to drink liquids and more desire for food. By the next afternoon, he was back to normal temp, back to reading with the girls, playing music and eating normal. Phew!!! We have no idea what the cause was, he had diarrhea, but nothing else. ed pretty flat for the next few days. School was becoming easy to do underway and cooking meals down below were no longer an issue for me. Everybody seemed to be getting I a groove by day 3.
ful day, but not much in the way of forward movement. We lost our wind by 11:00 am, but just had enough to maintain our course at an average of 2 kts. Mid afternoon we took a dip in the deep blue. We tied ourselves off and towed behind. The girls were in, playing for almost an hour! Day 6, I start my 11pm night watch ending the day with streaks of shooting stars jetting through the water. Like comets flying through space, we had dolphins surrounding us. Unable to distinguish exact features, but able to see every move by the bioluminescence trailing behind them on every turn. They jetted forward, backward, sideways, in the air, and return again forward. Moments like these are so magical and a perfect way to end day 6. Reflecting on our day, we only did 57 miles from the last sunset to today’s sunset. Early this morning our wind completely died. 7 am we turned on the iron sails. Based on the forecast from the Amigo net and our downloaded grib from PredictWind, if we didn’t get a little bit further south before the Tehuanapec winds picked up, we would float here for a while and then get hit hard. We made the call to motor for 3 hours, our batteries needed a boost anyway. A bonus about motoring, the dolphins come to play! h the motoring helped us really. I guess the 15 extra miles it brought us could make a big difference later. We’ll see. Needless to say, we did a lot of drifting today. Boatschool, lots of reading, playing musical instruments, playing games, making food, pretty much sums up the day. We did see a Marlin swim by us at one point as well as sea turtles and more dolphins. Day 7, we’ve completed 457 miles by the time sunset arrived. The last two days has not taken us far. Today especially was grueling. We ended up motoring for 5 hours to boost our speed and boost our batteries. Although we had decent wind 5-8kts on a close reach, we were only going 1-2 kts at best. We were fighting a 1.5 – 2 kt current. We needed more wind and it wasn’t there. We kept full sail up and trudged forward, most of the time. There was a lull between 8pm and 12 am where we might have sailed forward but actually moved backward. Ugh! Our estimated 2 week passage is looking more like 3 weeks. We are hoping for the Tehuanapec winds to help move us through this counter current until we can head in toward Costa Rica. Spirits remain high aboard Shawnigan . Ellamae stated today that she enjoys long passages ! Yay! I am enjoying this as well, but there is something frustrating about knowing the wind could be moving us at 4 a 5 kts and all we are seeing is 2-3.5 at best. Oh well, we sail on. , we complete a full week of sailing our passage. We’ve covered 555 miles with a remaining of about 800 miles. Still fighting a current, but less push to the north and more just west. We finally have enough wind to push us along at 5 kts under full jib and single reefed main. We are likely to have at least another week if not more of sailing, making our way to Northern Costa Rica. We’ll see where the wind takes us. it begins. We officially sailed into the zone of the Tehuanapec winds. From early morning on, the winds slowly progressed over the day, on our nose out of the Southeast. Most of our sail so far has been upwind, surprisingly. Now, we had upwind at higher speeds a current to fight and swell picking up. I quickly lost my ability to do much of anything down below, and I definitely wasn’t doing any reading or writing. It was a good thing it was Saturday and we were off of boatschool. Assuming we would get days like this, I had pre-prepared food that would require much on my end to serve up. By 4pm we double reefed the main and furled in the jib to about 100%. By 5pm we furled in the jib completely and raised our storm jib staysail. The winds had reached a steady 30 with gusts in the mid 30’s. The swell had picked up to about 4-6 ft at 6 sec intervals. 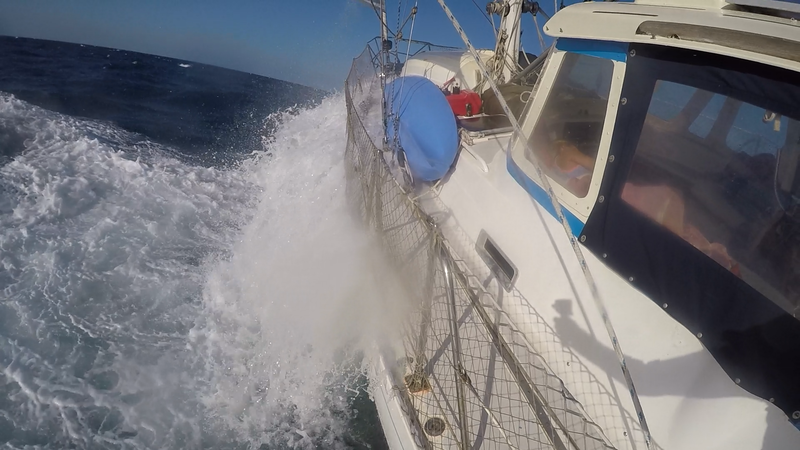 Our bow was plunging straight into the swell, dropping our speed to a 2-3kt average. Thankfully the higher wind speeds only lasted about an hour, then we were back to furled in jib. During Nina’s watch (8p-11p) the wind backed off a bit. When I came on at 11p I was able to unfurl the jib more and start pointing Shawnigan more Easterly. We were almost to our “halfway” point at about 700 miles and we’re finally starting to head back toward shore. After midnight, Santa managed to find us! I somehow pulled it together enough to maintain my sea sickness to prepare for Christmas while the rest of the crew slept. I had to make frequent trips to the back deck to breathe fresh air, but it worked. mas time! It was everybody aboard’s first Christmas out at sea. Santa received our tracking information from our IridiumGo and PredictWind tracker. The wind was still blowing 15-20 with the swell slowly getting bigger, but now a little more on our beam. The kids were excited, they had no problems staying down below to open presents and go through their stockings. It was a great day! We all started to acclimate to the new sea state that blew persistently between 20-28 as the day progressed. We maintained our double reefed main and adjusted the furl on the jib accordingly. I managed to put together a nice Christmas dinner. I had defrosted Mahi Mahi (thanks SV Scuba Ninja for the fish!) and planned on making a cranberry crisp, so I was determined to make that happen. I felt less woozy, but was aware of my limits. Dinner was prepared in segments with a lot of outside on deck time in between for fresh air. I did it though! Mahi Mahi, browned butter “Herbs de Provence” and garlic mashed potatoes, stewed carrots, and cranberry crisp for dessert. Our Christmas Day ended well. We all turned in at 8pm, Nina took her watch from 8-11p. heading up as high as we can. Sea state is quite lumpy. Swell 4 -5 feet at 6 seconds. Maintained double reef main and furled in or out the jib as needed. I could hardly keep the nausea subsided. Everyone else was pretty good. The girls somehow managed to do school. Made more easterly in our course. e down and took a meclizine for sea sickness just so I could actually go down below and cook for a bit and help out with school. Days like today we end up doing more oral education than written. 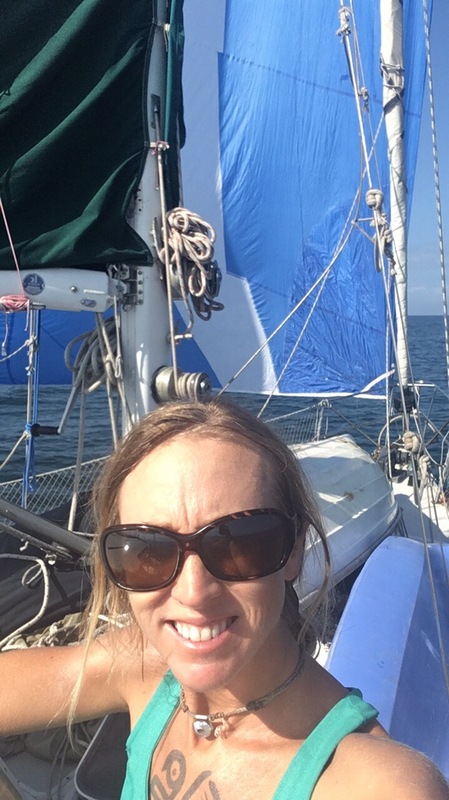 We ended up back under staysail for a few hours when the wind, still on our nose was blowing low 30’s. Unfortunately our heading is further south than we’d hope for. The wind direction is just not in our favor this voyage. The swell today from the Papagayos was 4-6 feet at more like 4 seconds. Glad I took the pill. At midnight we reached 1010 miles. approaching 2 weeks of being out on our passage that we thought was about 1,400 miles and roughly 14 days. At the beginning of my 11p -3 am watch I do the calculations and see that we are at 1,100 miles completed. In theory we should have 300 miles left to go, but the winds have lead us so that we are still over 450 miles due west of Costa Rica. We basically have been pointed as high up into the wind as possible since day 4. “Little Red”, our hydrovane, has kept us on that course with precision. Mother Nature, the wind direction, is wanting us to stay offshore a bit longer than we thought she would. Today we ate our last apple and only have two pears and a watermelon for fresh fruit. We do have a few freezer bags of frozen fruit, but I must admit, we should have grabbed that extra bag of apples. For veggies as well, we are on our last few days of fresh vegetables. Again, I did prep some frozen veggies that we’ll tap into shortly. This is a good practice run for provisioning for crossing the Pacific! Oh and I’m over my sea sickness. Never did I throw up, but getting flush and slight nausea is no fun. I’m back to going down below to cook and back to reading and writing. Notice how the daily log is getting longer 🙂 . of relief finally came. The sea state began to calm, even as we continued to head as high up into the wind as possible. We continued south southeast until about 11 am, when we reached latitude 7.46N, which was pretty much exactly what the weather grib showed as the southern edge of the Papagayos. 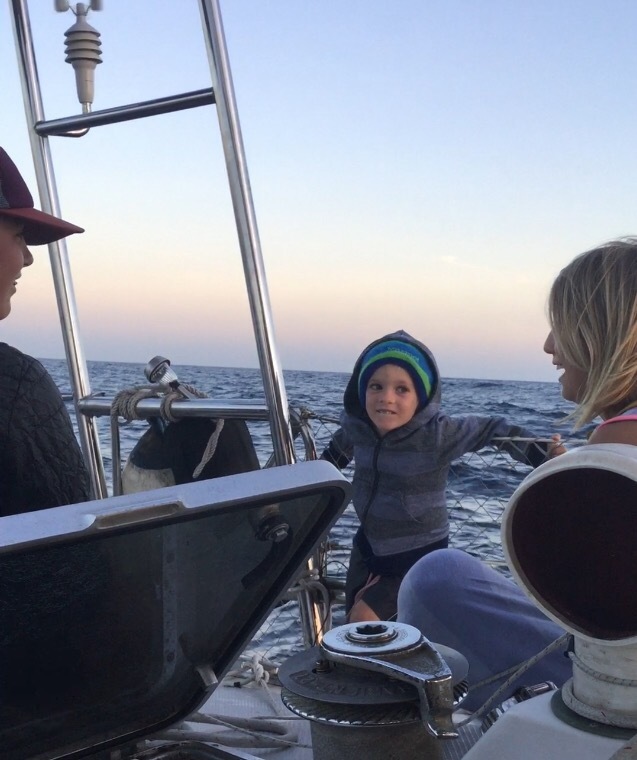 When we reached lat/long of 7.4453N, 90.5598W, the wind started to allow us to veer more east and even a little east northeast by 7pm and we were finally back under full sail. Yay, we were finally heading in toward Costa Rica! By 11pm we were heading northeast and back up toward where we wanted to land in Costa Rica, about 350 miles away. Day 15, we are officially 2 weeks out into our passage and as of 11pm over 1,300 miles tracked. After a full 16 hours under full sail, we spent most of the day back under double reefed main and various furled in jib amounts. With sustained winds in the 20’s and gusts in the high 20’s, we got little reprieve today. Still heading up wind as high as possible we are just barely able to make an easterly heading. We will make Costa Rica in the next few days, but at the point we are unsure where. Today seemed to be a little of a tipping point for us. Although not terribly uncomfortable, we are tired of this constant upwind track. The Sea state is calmer than it had been, but it feels like we are literally sailing “barefoot, uphill both ways in the snow”. It’s actually not that bad, but we are definitely feeling fatigued from the day in day out activity. Sleep deprivation never helps and although are watches are manageable it adds up after a few days. 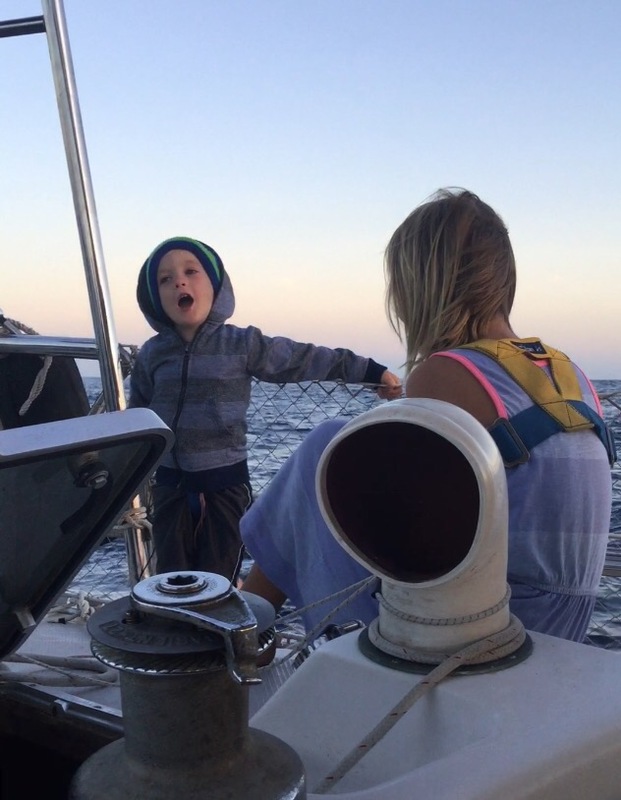 Nina taking watch from 8pm – 11 pm has been an awesome add on to our sailing dynamic. Having Taj’s almost constant demand for attention, on the other hand, has been a challenge. With some moments of solitary play, the rest of the day is filled with “tell me a story” or “can you play with me?”, or “read me a story”, These are all precious moments that we will cherish, but we would be lying if we said it was easy. School has been great. I’m impressed that the girls have been able to do so much under these sailing conditions. We decided to wait to have Christmas/Winter break for when we make landfall. 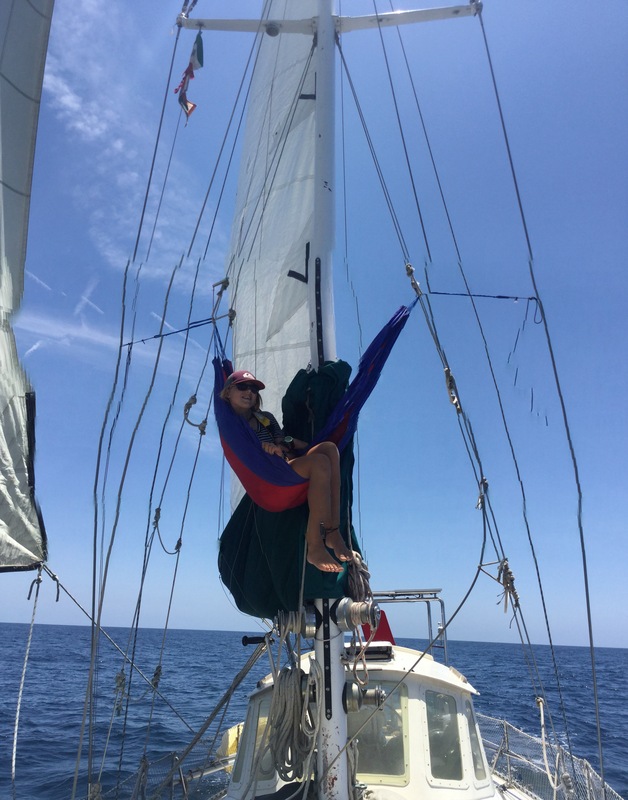 It only makes sense to do school while we’re just sitting around all day sailing, that way when we do get to shore, we can hit the ground running and exploring. day to end the year on. After bashing upwind for the last 10 days, today, although still on a close reach, was a bit of a break. We were under full sail for the majority of the day. We put away the staysail, which is set up with a pelican hook, took down the running backs, and cleaned up around the boat. We had been heeled over on our starboard side for so long that everything on the boat had shifted a bit, and gooseneck barnacles were growing on our hull paint! Today almost felt as if we were at anchor compared to the last 10 days. What a relief! To celebrate the end of the year, Christian and I made some bulletproof coffee at 4pm. That was our “champagne” toast for the new year. We had a lovely butternut squash with a cilantro cashew “cream” sauce I made, and a purple cabbage slaw for dinner. We watched the sunset behind our stern as we headed east at about 3 – 4 kts with about 5 kts of wind, still on a close reach. At the strike of midnight we reached 1,400 miles exactly! What a great mile marker for a Happy New Year! We have about 200 miles to go and now we find ourselves becalmed. The night feels magical. The full moon is straight above our mast shining so brilliant that it almost looks like dawn has arrived already. If you could see Orion, his right arm, raised so nobly in the air, would appear to be holding the moon in his hand. Hopefully this break in wind is just a wind shift that will have us going in the direction we would like to go in, but down wind for once. So now that it’s midnight and it’s officially January 1st. I will post this to our blog using our IridiumGo. Again, I will add to it with more daily logs and pictures once we get wifi, but for now, here you have a glimpse into our passage thus far…. Happy 2018! Addendum : Day 17, January 1st, 2018. We are closing in on Costa Rica. With a 80 mile day, we drifted quite a bit of it, motored for 4 hours of it, and sailed upwind at 2-4 kts for the rest of it. The last few days have been quite overcast, nice on the temperature not so nice for the battery bank, so motoring was well used. We charged batteries, kindles, toothbrushes, used the blender etc. We are all excited at the prospect of seeing land tomorrow. Although it’s highly likely that we won’t come into anchor until Wednesday, depending on our wind. We won’t be making landfall as far north as we’d hope for, but we are managing to head up fairly high. Day 18, with less than 150 miles to go, our spirits were a bit higher today. We started the day with light winds on a close hull to many hours of no wind and drifting. We downloaded a weather grib and saw that we were basically in the center of a dead zone and we were getting pushed backward a bit with a current. We decided to turn over the engine and motor for 5 hours to get ourselves in a better position for wind. Sure enough, we did and we slowly sailed at 2-3kts with wind finally aft of our beam. Could it be that we finish our 1600+ mile southbound upwind passage with the wind behind us?! I started my 11pm watch with my usual #shipshape routine. About 30 minutes of yoga/core exercises to help wake me up and get my energy up. I’ve managed to do something every night for the whole passage. I needed something to keep from muscle atrophy 🙂 . At midnight we reached 1570 miles! If we manage to keep this wind and direction for the next 50 miles we should make Punta Leona anchorage by nightfall on our 19th day. Day 19, upon daylight we were just west of Gulfo de Nicoya, Costa Rica. The sweet smell of earth was abundant and the land was so green. The wind was light, but enough to sail, the only problem was that in each tack we took it would turn us 180 degrees heading parallel with the coastline. There was also a current keeping us out at sea. We were 6.5 miles from the closest point of land and 33 miles from the anchorage we wanted to go to. After 5 hours of trying to tack back and forth and make and not make any headway, we turned on the engine and motored 6 hours into our first anchorage in Costa Rica, Punta Leona. We arrived at 5pm in our 19th day of our 1650 miles passage, over 1300 miles of which was tight on the nose, upwind sailing. We were all relieved to reach land. Costa Rica is so lush. The kids immediately grabbed a paddle board and Taj grabbed his kayak and went to shore. The Ship wreck from 2015 off of Barra de Navidad. a little hitchhiker Homemade Mayo with left-over Mahi Mahi made into a salad cabbage wrap. Another few hitchhikers! Day 19, we see land!!! Punta Leona, Costa Rica. This entry was posted in Adventure, alternative living, Boatschooling, Cruisers, cruising with kids, cruisingkids, kid boats, kids on boat, PredictWind, Sailing blog, sailing family, Sailing with kids, Shipshape, traveling family, World travel and tagged #sailinstagram, adventure family, adventure with kids, afamilyafloat, alternative living, boat, Boat life, boat teen, boating, cruising world, cutter, family of 5, fitsailor, iridiumGo, kid boat, kids 4 sail, kids on boats, live aboard, long passages with kids, ocean, PredictWind, sail, sailing, sailing adventure, sailing family, sailing life, sailing mexico to Costa Rica, sailing mom, sailing teen, sailing the world, sailing to Costa Rica, sailing with kids, sailing world, sea, shawnigan, shipshape, sloop, stevens40, sv shawnigan, teens on boats, tiny house, traveling family, traveling with kids, World travel on January 1, 2018 by A Family Afloat. We left Marina Mazatlan May 14th around 7:30 am, timed with the tides again. The swell was down, unlike coming in, the timing this time around was not as crucial. We had a minimum 2 day if not possibly 4-5 day crossing ahead of us, so an early departure was not necessary for the purpose of timing our arrival. Mike on SV Easy departed just before us to buddy boat across. We planned on communicating via predetermined SSB frequencies once our VHF was out or range. The first day out was pretty mellow. We were forced by the wind to make a more north, northwesterly point of sail, which was fine. 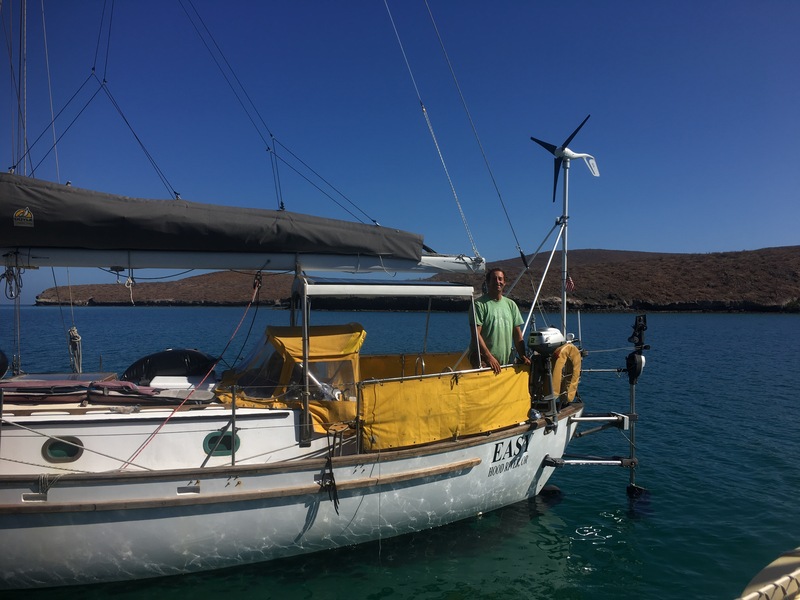 We motored for about an hour, just enough to get out past Isla Pajaro and catch a zephyr of wind. 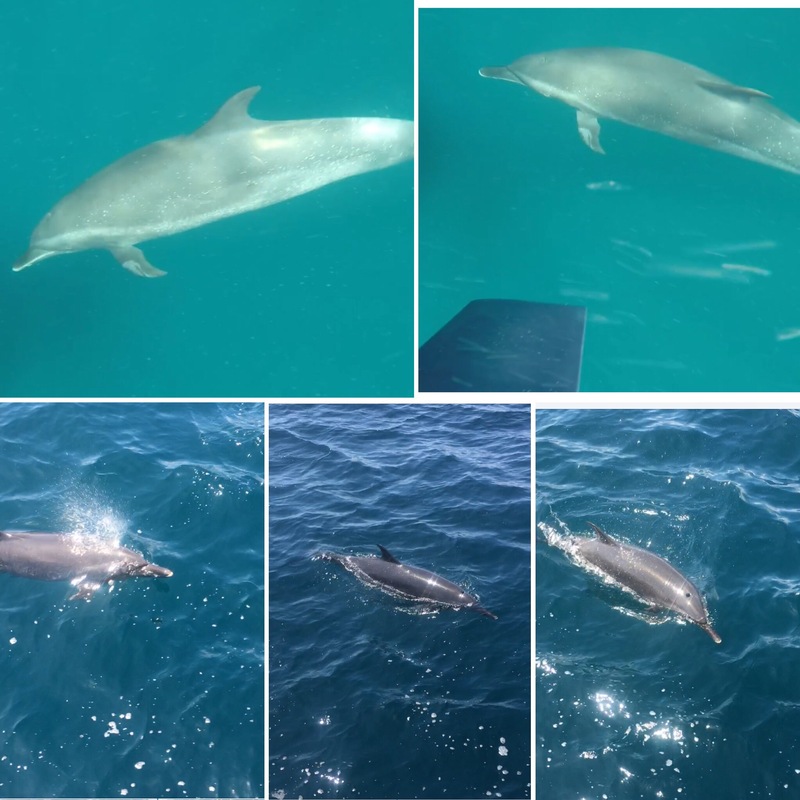 It was Mother’s Day, the sun shown brilliant, and dolphins came to swim off of our stern. Christian tried to join them in the water by tying himself off with a rope and filming with the goPro. We are pretty convinced that dolphins can hear our heartbeat, because as soon as he got in the water they swam away. When he just had the goPro in, they stuck around. Me with my Happy Mother’s Day smile after the dolphins visited. The next day, was my birthday. I turned 36 and it was my first birthday celebrated out at sea. The day started out calm. I had planned to talk with my travel nurse recruiter via Satellite phone to try to pin down a travel job for the summer. We had already been conversing but nothing was final. I knew I needed to get something pinned down, but we were ready to set sail, so IridiumGo to the rescue! I had my nursing recruiter call me via satellite phone to secure a job while in the middle of the Sea of Cortez. I was shocked at how well the reception was. The call was dropped a few times, but we were able to get what needed to be done done and secured a job at Kaiser San Francisco for me in the summer! That was a pretty good birthday gift. This is where we were mid day on my birthday. The kids loving Birthday cake in the middle of the crossing. Later on that afternoon, the wind picked up to the mid 20’s and by evening was in the high 20’s with gusts of low 30’s on a close reach (upwind). We were double reefed with our Mainsail and furled in jib to about 90% for most of the night and the next day. Despite that our boat was handeling it well, and the hydrovane kept us steering perfectly, I got a little sea sick. The kids did too, but thankfully, no one reached the point of vomiting. They still were able to eat my birthday cake. Although I was able to maintain good spirits I was rendered almost completely useless. I can’t go down below to cook at all, let alone help the kids with anything. Tacking, trimming sails, steering is fine though and is actually helpful, so I don’t mind being “on watch” when I get sea sick. By nightfall I was feeling fine as long as I stayed focused and outside. I did end up taking a Bonine to help me keep from throwing up and fall asleep during my limited time off watch. Love this “tilt boat’n” action! Water spilling over the rail, SV Shawnigan holding strong and steady. The kids just relaxed or slept in off under the comfort of our dodger or they clipped their harnesses on and went outside for fresh air. No boatschooling was happening this crossing. So far no one on our boat has gotten so sea sick to the point of throwing up since we left in August 2015. I’ll take it as a sign that we’re getting the hang of it. All clipped in on the aft deck, singing songs into the wind to pass the time. Ellamae lounging in the dodger. 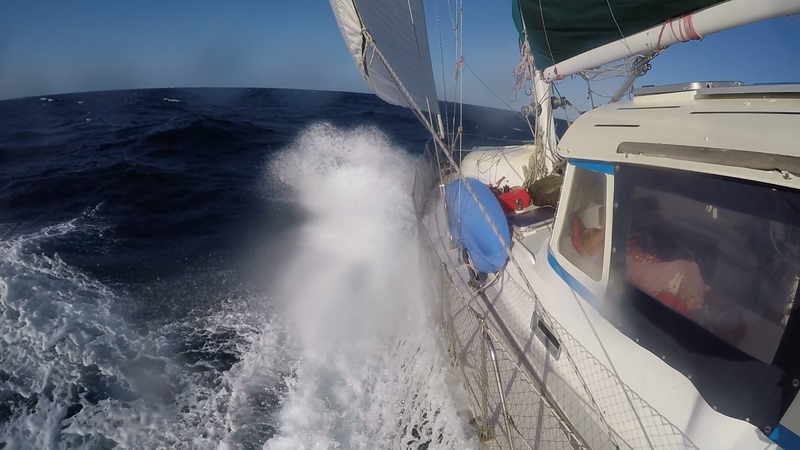 By the end of the third day the wind had us going north again, north of Muertos off of Isla Ceralvo. We tacked up before being able to tack back towards La Paz. We made it up until the channel below Isla Espiritu Santo before turning on the engine for that last hour. We made to Anchorage just north of La Paz, called Caleta Lobos, just after dark. Fortunately we’ve anchored here many times before, so coming in at dark was not ideal, but ok. The anchorage was flat and we slept so well! Taj fell asleep, clipped in to the back stay! Then again in the dodger… Nina perched up in a hammock on our first day out, while it was calm. Mike on SV Easy at Caleta Lobos (just north of La Paz). Stay tuned for our adventures in La Paz and up the Sea of Cortez via the east coast of Baja. This entry was posted in Adventure, boatschooling, Cruisers, cruising with kids, cruisingkids, kid boats, kids on boat, Sailing blog, sailing family, Sailing with kids, traveling family, World travel and tagged #sailinstagram, a family afloat, adventure family, adventures with kids, afamilyafloat, Afamilyafloatblog, alternative living, birthday underway, Boat life, boat school, boatschooling, crossing the sea of cortez, cruising, cruising life, Cruising the world, cruising world, easy's voyage, family of 5 on a 40 foot boat, gopro, homeschooling, iridiumGo, kid boat, kids on boats, kids4sail, mazatlan to la paz, mexico tourism, mike jacoby, navionics, sail, sail to surf, sailing, Sailing blog, sailing family, sailing life, sailing mexico, sailing the world, sailing with kids, satellite phone, sea of cortez, sparkmen and Stephens design, stevens40, sv easy, tiny house, travel blog, travel nursing, traveling family, traveling with kids, traveling with three kids, world schooling, worldschooling on July 7, 2017 by A Family Afloat. Our Global Connection for Satellite Phone is on it’s way!!! 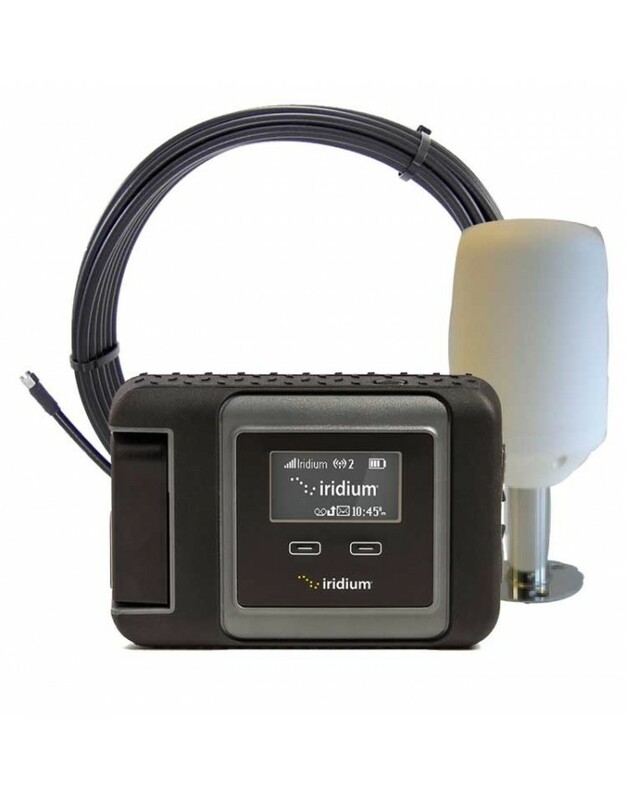 We decided to go with the iridiumGo! through PredictWind. I think this is one of our largest purchases, yikes! After reading many blogs and reviews, this seems to be the best fit for us. Hope we’re right! We’ll be able to get updates on the wind, rain, swell etc through the satellite phone and on to our computer. We are familiar with other ways to stay safe with weather predictions, just in case technology fails, but having this aboard SV Shawnigan is super exciting. We will have unlimited SMS (texts) in and outbound! Yes, you can text us or we can text you while we are in the middle of the Indian Ocean! Or anywhere, for that matter. We can also update our position on the map. See us on the map somewhere? You happen to be going there for vacation??? You can send us a message to meet up! 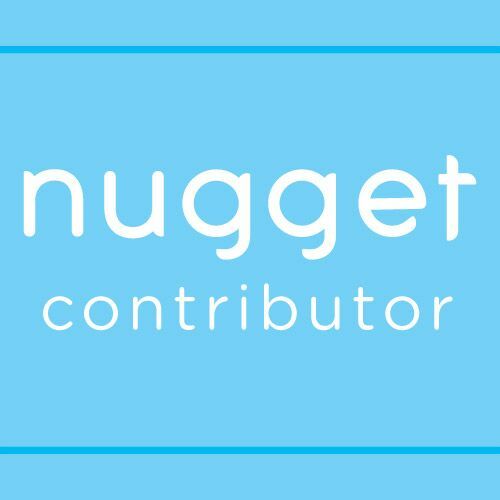 We will also be able to keep our blog (mostly) up to date! With a few pictures here and there and some text to go with it, we will be able to post to the blog in the middle of a passage. 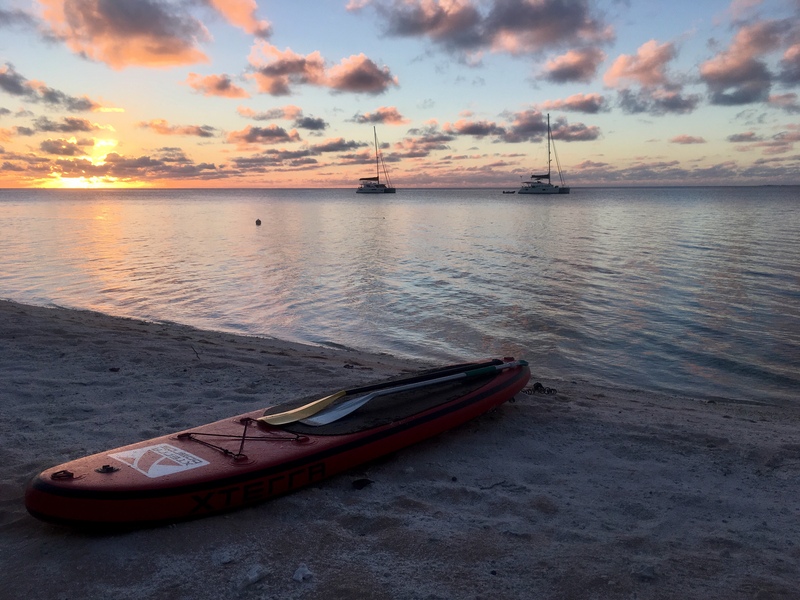 Part of our purpose in sailing around the world is to “disconnect”. So having this technology will add a element of practicing will power. Will power to not post or stay too connected too often, that is. Not that we don’t love you all, but we really want to experience the world as mush as possible and do it safely. 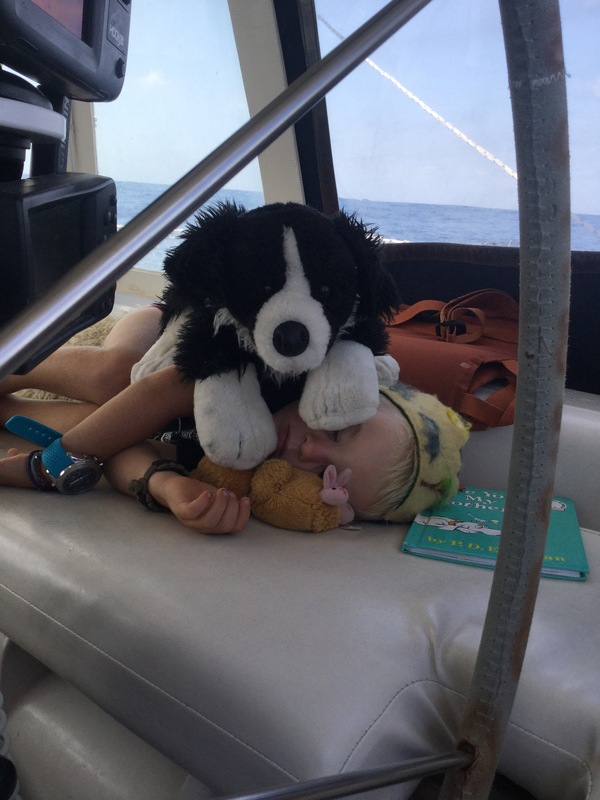 This entry was posted in boatschooling, Cruisers, cruising with kids, Sailing with kids and tagged afamilyafloat, boatlife, cruising family, cruising kids, GlobalConnection, gribfiles, iridiumGo, PredictWind, sailingtheworld, weatherupdates on July 19, 2015 by A Family Afloat.